This one is pretty hard. Can you answer at least 7 out of 10 correct? Where do the couples go in "Couples Retreat"? What city does "The Hangover" take place in? Which Academy Award-winner directed "Hugo"? Which villain did Spider-Man battle at the end of the 2014 film "The Amazing Spider-Man 2"? Who returned to play Morton Schmidt in the 2014 film "22 Jump Street"? What is the Hogwarts school motto? Which Alexander Payne film starring George Clooney won Best Drama at the 2011 Golden Globes? What actress appeared as a man-eating boss in "Horrible Bosses"? Which musician turned actor starred in 2011's "Friends with Benefits"? What is the post-apocalyptic science fiction film based on a graphic novel? 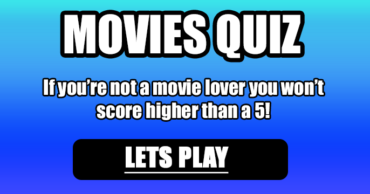 Film Trivia Quiz – Have you seen all of these movies? Are you a big movies fan? Complete these titles to prove that you are! 1970s Movie Quiz – Can you complete the titles?